Hello friends, welcome to the WP Nearby Places tutorials. My name is Yash, and today I'm going to show you a whole new product of WP Nearby Places which is known as our WP Nearby Places Coupon Ad Engine. If you want to give your neighbors the easy ability to advertise on our website, then this product will definitely be for you. 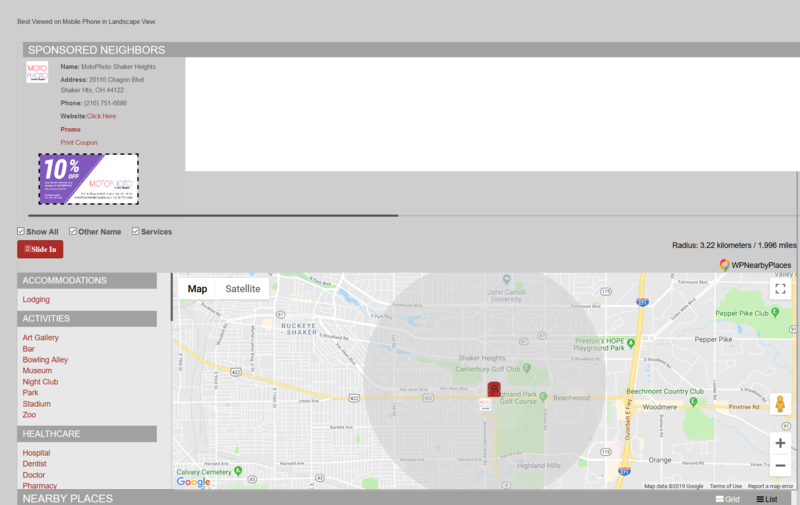 With the help of this product, you can show your neighbors on your website, in your WP Nearby Places map page. Let me show you how it will look. See, someone now can advertise their business and show their coupons and promotional codes and coupons. Now your neighbors will be your "sponsored neighbors". To become a sponsored neighbor, they need to follow some simple steps. What steps do they need to follow? This is the simple guideline, what they need to do. They just need to fill out a simple form. There are some necessary fields like business name, email address, phone number, their address latitude and longitude, business website, their promotional page, business category, and their logo. Now there are mainly two options available to create a coupon. The first option is to create their own coupon without any charges. To do this, they just need to follow the link given. It will redirect them to the Crello.com website. Over there, the default sizes are already available: Width is 975 and height is 495. They just need to design their coupon and download that coupon, and after designing their own coupon, they just need to upload their coupon here. Otherwise, we can also provide one more option, which is known as "Let Use Create Your Coupon" from our end. For that, they need to pay $20. We will do it for you. They just need to provide their company name, company address, which type of coupon they need to design, like a flat discount coupon, percentage discount coupon, these types are available. Also, some necessary details about their particular coupon and the expiration date of that coupon will be needed. We also have some ready designs available for the coupons, with a link showing examples of the type of designs we have available. You just need to mention the coupon number. That number mentioned on the particular coupon is entered into a field on the order form. For example, which coupon do you like? You just need to select that particular coupon design from a dropdown on the form and just click on the pay with PayPal button; and once you click on this button, you will be redirected to the PayPal payment link. There you just need to pay $20 and you will get a coupon design by us. The information which I just showed you is from a user's perspective. Go to the new website and complete a fresh installation of the WP Nearby Places Coupon Ad Engine plugin. For that I just click on "Add New" in the plugins section in the Admin section of your WordPress website and upload the plugin. 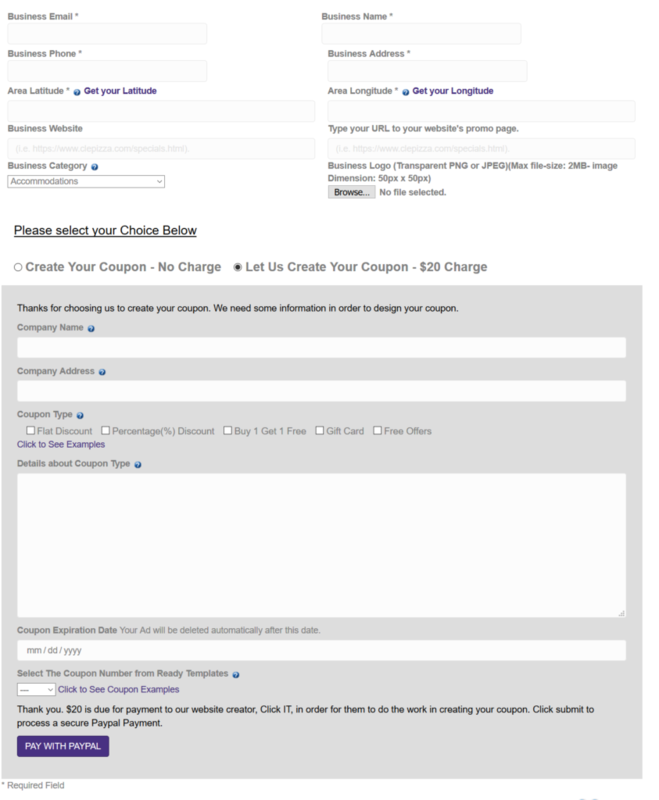 Then, you just activate the Coupon Ad Engine plugin in the new website. In this info page, all the information is available for how to use this WP Nearby Places Ad Engine, with Coupon Ad Engine. As you can see to use this plugin we need to install all those three plugins. First one is Contact Form 7, the second one is Contact form 7 PayPal Extension and the third one is Advanced Contact Form 7 DB. We need to install and activate all those three plugins. 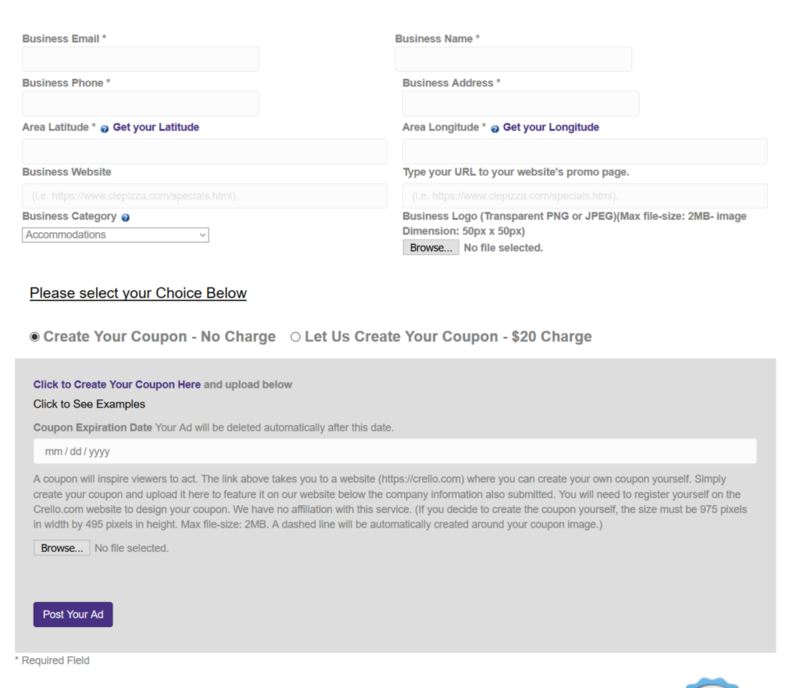 There and then we can use this WP Nearby Places Coupon Ad Engine. Okay, so as mentioned here, I install and activate all those three plugins, Advanced CF 7 DB, Contact Form 7 and Contact Form 7 PayPal Extension. Now let me activate the license key and ad the Google Map API. So I just activate the license key here and now let me add the Google Maps API. Let me save this. As you can see there are two more fields available. This is different than our regular premium version. Over here we need to put the sponsors' form shortcode, the contact us sponsors form shortcode. So let me give you a brief detail about that. Once you activate this Contact Form 7, we have already provided the ready Contact Form 7, which is same as what we have in our reference site, which I showed you earlier, to get that code, you just need to click here and you will get this TXT file. What do you need to do, you just need to 'select all', 'control C' and just go back to your Contact Form 7. Now create a new Contact Form 7. I'm going to give this form, the name of the form is 'Order Form'. That's it. Now just 'control A' and paste that code here. That's it. Now click on the 'save' button. You can change your email id and you will also get the details about message body here. For that, you would just again need to go to the Info page and the second tab of Contact Form 7, the mail tab, you will get the code here. 'Control A', 'control c' and go to the mail tap of Contact Form 7 and paste here in the message body, and that's it. Then we are done. You can change the email ID, as per the requirements. Just click on the save button. Now once you are done with that, you would just need to copy the short code of that Contact Form 7. Go to pages, add new. I'm going to give the name like 'Ad Order Form'. I'm using Beaver Builder as a standard builder for all of my websites. Now just paste your shortcode in a text block and just save it too, and you will see the whole form is here, done, publish. Now as you can see, your form is ready to use. Now the next step is to copy the ID of this form. The ID is 9090. So what we need to do, we just need to go to the WP Nearby Places settings tab here, and over here in this text box, we just need to put the code, what we have got in our shortcode, shortcode of Contact Form 7 - the ID, the ID of that form. We just need to put that ID here, and then click on 'Save' button. After that, we need to create our base location in our WP Nearby Places. So I'm going to create an ad area, Click IT store location 16 Main Street, Ohio and we will get our latitude, longitude. Let me upload the logo. Now the radius is in kilometer. So right now, it's one kilometer. I am not going to add any Featured Neighbor because we need to add our Sponsored Neighbor instead of Featured Neighbors. Okay. So save location, copy the shortcode, pages, add new. 'Map Page'. I'm publishing this page. Launch Beaver Builder. 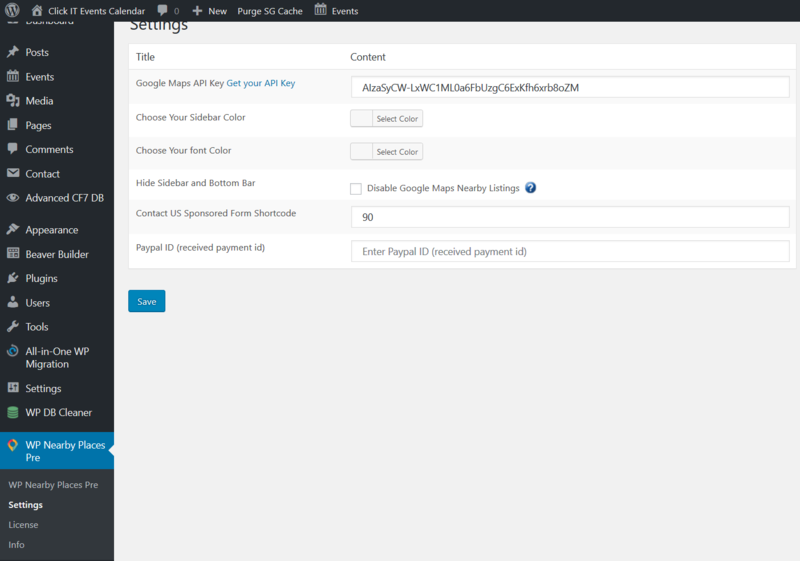 Now I'm going to paste that WP Nearby Places shortcode here, in this page. So friends, with the help of this WP Nearby Places Coupon Ad engine, we can help our neighbor to get some good business through this advertising and get some good growth. So Friends, I hope you liked this Tutorial. Please let me know if you have any questions or suggestions. Thank you very much.